This 5-track sampler is taken from the brand new First Word compilation Two Syllables Vol 2. We've picked out the more DJ friendly tracks to put together a tight EP, that showcases the album perfectly. Ill Connoisseur by kidkanevil is an uptempo horn-driven club cut, in the vein of Mr. Scruff and Quantic. A slight departure for kidk, but dancefloor dynamite nonetheless. 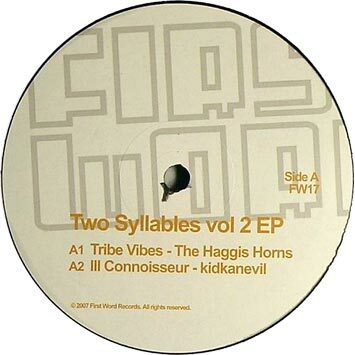 The Haggis Horns' Tribe Vibes is an afrobeat stomper from the Haggis boys. A natural progression from the massively successful Traveller from 2006. 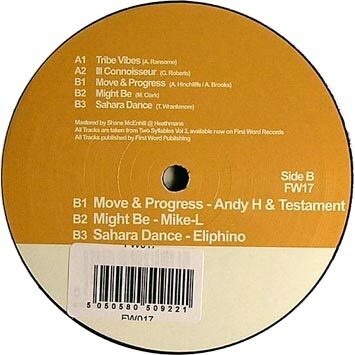 Next up is Andy H, with Move And Progress ft Testament. It's a bass-heavy club rumbler from DMC finalist Andy H, with on point vocals from Deisler and kidkanevil collaborator Testament. Kind of Danny Breaks meets The Nextmen. Might Be by Mike-L is a club-friendly, sample-heavy cut from the much missed Mike-L. Look out for a new 7" from Mike and an album in 2008. Last but not least, Sahara Dance is the first track on the label for the exciting new beatmaker Eliphino. The influences of Dilla, Madlib and Pete Rock are evident, but this guy has a style all of his own. Look out for tons of beats from this guy in the coming months.